Morpheus Photo Morpher is an interesting digital photo animation software which can create amazing effects on two selected photos by transforming one into the other before our eyes. This amazing image editing software takes two uploaded images and creates a morphing transition between them. The end result can be very funny. For instance, you can upload your photo and your pet’s photo. Through the morphing effect, you can see your face slowly turn into your pet’s photo. Morpheus Photo Morpher has released its lasted version Morpheus Photo Morpher V3.11 in the market. There are three packages available in the Morpheus Photo Morpher series, namely Morpheus Photo Morpher V3.11 Standard, Morpheus Photo Morpher V3.11 Professional, and Morpheus Photo Morpher V3.11 Industrial. The standard version is about $39 whereas the professional and industrial versions are $99.85 and $199.80 respectively. Of course higher prices always come with more features, e.g. ithe ndustrial version supports movie files to be loaded as well as still photos. The price list here might look a bit pricey, especially if users want to create some morphing photos for non-professional use, e.g. school project, fun with friends, etc. Users can probably try the promotion offer given by Avanquest. Avanquest via its promotional campaign allows users to download Morpheus Photo Morpher V3.0 Basic, an older version to the latest Morpheus Photo Morpher V3.11 series. Morpheus Photo Morpher V3.0 Basic offers the basic features for users to create the morphing effect in their photos without any cost. It is fast, simple and the effect is interesting. If users want to grab this free software, users can go to the Avanquest promotional site via the link here. Users need to register an account with Avanquest if they haven’t. If they have registered, users just need to key in their email address under “For Avanquest Registered Users:” box. Users will thence be prompted with the download link together with a valid password for activation. The same activation password will also be sent to users via the email entered. 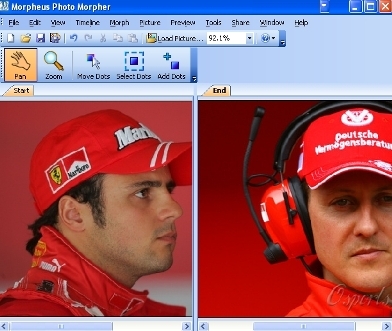 Users can thence download and install the free photo morphing tool. During installation, users will be prompted a dialog box to enter the valid password. The installation process is fast. Overall the software itself is pretty user friendly. Users just need to upload to photo to create the morphing effect. However, since Morpheus Photo Morpher V3.0 Basic is given free under the Avanquest promotional campaign, users need to bear with the frustrating experience whereby when they click on to some features, they will be promoted with a dialog box requiring them to upgrade the Basic version to Standard or Professional versions with some costs incurred. Users can ignore the message and continue enjoying the software if they don’t really need the features.